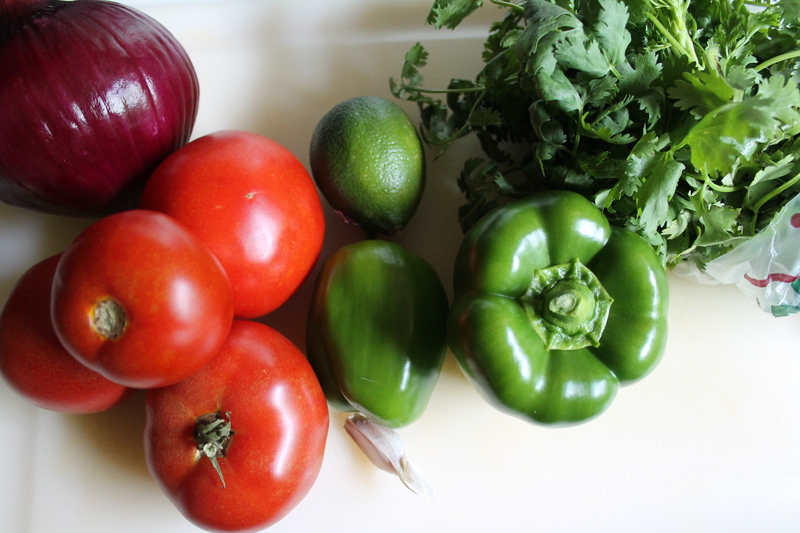 I so want to tell you about how awesome this pico de gallo is, and how I grew some of the tomatoes and all of the green peppers. But first, I have to tell you that while I was making this delicious, amazingly fresh summery salsa, my son was eating crayons. CRAYONS! I cannot get the child to eat a fresh fruit or vegetable to save his life, but crayons are yummy. What!? And he was so sneaky about it, too, just sitting in his chair and pretending to color quietly whenever I poked my head in to look at him, and taking huge chunks out of yellow and green as soon as I turned back to chopping. Motherhood, friends…motherhood. I don’t know what I’m doing. 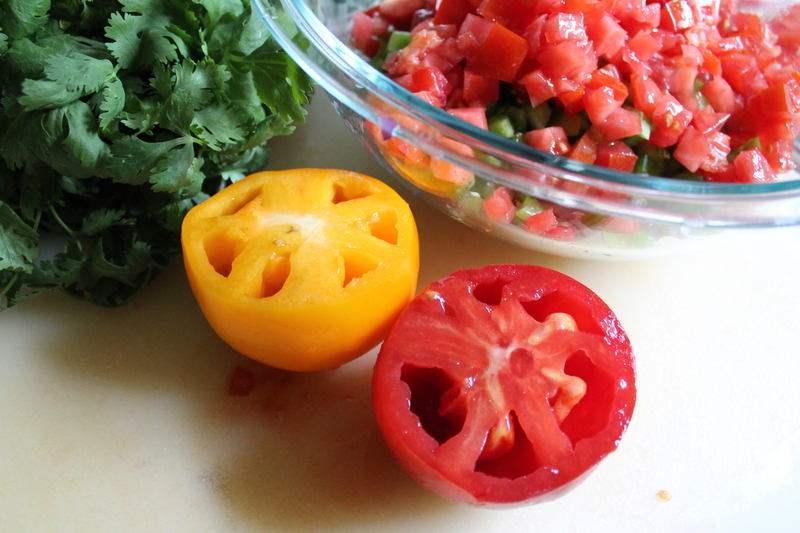 There really is nothing to this pico de gallo, just chopping. Lots and lots and lots of chopping. Word of advice: don’t distract your toddler with a coloring book and a pile of crayons while you do said chopping. 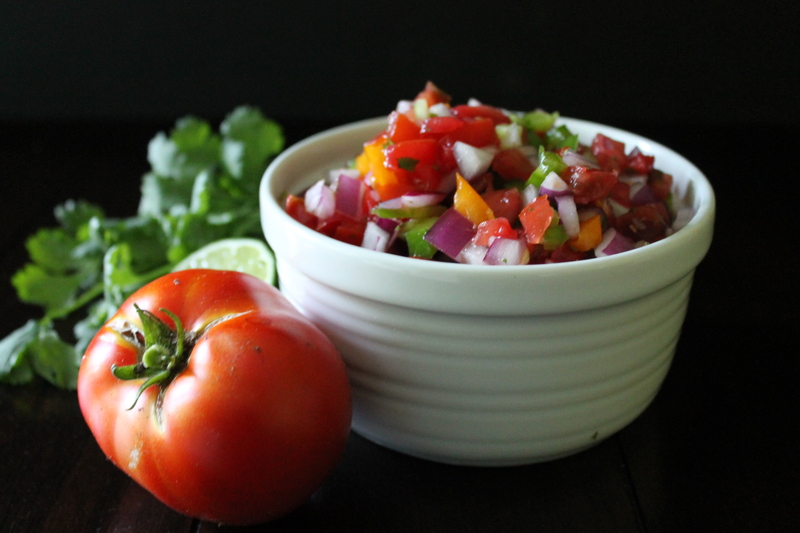 This recipe makes a fairly massive amount of pico de gallo: enough to share with friends and neighbors! Seriously, share it. Or have a taco night! You don’t want it to go bad before you finish it, because that would be truly tragic. I used six tomatoes: four red tomatoes from my neighbor’s garden, one yellow tomato from the farmer’s market, and one purple cherokee grown in my back yard! Woot! I also used green peppers that I grew myself, thank you very much. Because I went with green peppers instead of jalapeños, the salsa was flavorful and mild. 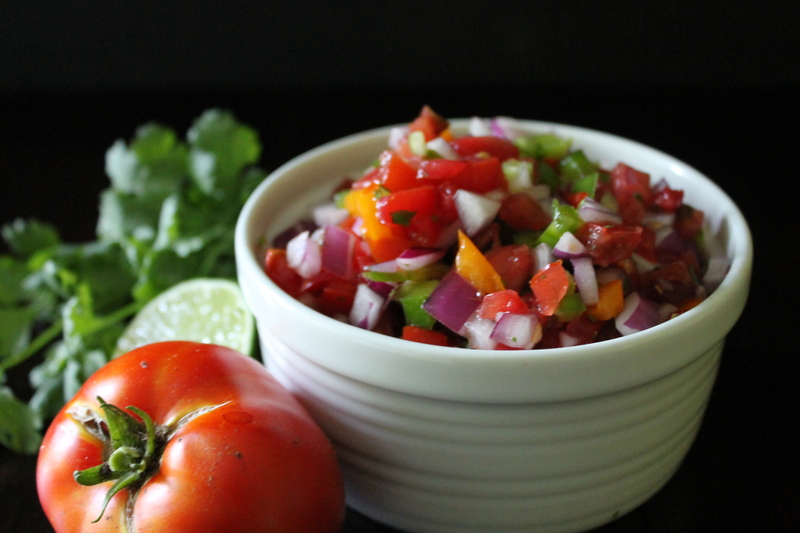 Of course, you can add or substitute some hot chiles if you prefer a little kick in your pico! Because the whole recipe is chopping and stirring, I will leave you right to it! Seed the tomatoes and cut into a medium dice. Dice the onion and green peppers small. Combine the veggies and cilantro in a large bowl and toss. Juice the lime into the bowl, then season with garlic, salt, and crushed red pepper. Stir. Taste and adjust seasonings as needed. Serve with chips, quesadillas, fajitas, soups, etc. Store in an air-tight container no more than 1 week. Hi! I'm Melissa. I write about God's grace, food, family, and projects.